Just as downrigging allows you to control the depth of your lure presentation, Planer rigging is a trolling technique that allows you to control the width of your lure presentation. This technique is especially effective when fishing for "boat-shy" game fish. Planer rigging allows you to spread your lure presentation out to the side of your boat. Depending on the height of your planer mast, the "planing device" can achieve distances up to 100 feet to the side of your boat. Being able to cover wide areas of water greatly increases your chances of putting your lures in front of the fish. First; Bring your boat to trolling speed and place the planer boards in the water. Let out the tow line until the boards travel to the desired distance from the boat. Lock the clutches on the tow line reels. 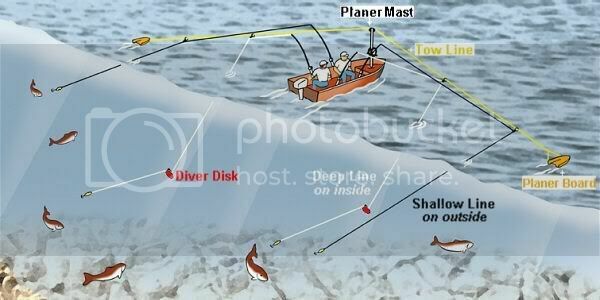 Second; Let out your lure to the desired distance behind the boat and attach a planer release to your fishing line. Next, clip the loop of the planer release around the planer tow line. Third; Let out fishing line from your reel, allowing the release to slide down the tow line and away from the boat. Next, set the clicker and drag on your fishing reel and place your rod in a rod holder. An effective way to vary the depths of your lure presentation is to tie a Diver Disc four feet ahead of your lure on some lines. It will take your lure to depths of 45 feet. Use this technique on the lines closest to the boat.